Comments: Deciduous broadleaf native to northern Africa, southern France, Spain and Portugal. Leaves are lobed, dark green and about 3" long. Leaves persist well into winter and sometimes persist year round. Bark is brown and rough. Specimen tree is 8' tall and will grow to 30' to 40' over time. 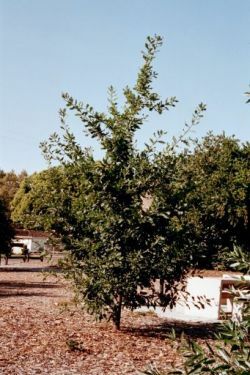 Also known as a Mediterranean oak.